This range of quartz single distillation provides answers to pure water requirements. 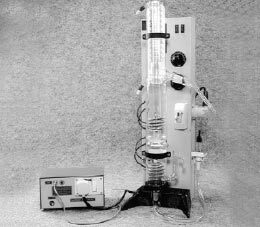 High quality electronic grade quartz boiler ergonomic design together with minimum maintenance combine to provide a product that gives reliable service for years The water distillate obtained from quartz single distillation is better when compared with water distillate obtained from other type/method of Distillation, with utmost precaution this apparatus can be used for acids. The unique condenser design ensures that the droplets of distilled water remain in contact with the cooling coil for the longest possible time producing cold distilled water and pre-heating the boiler feed to increase efficiency. 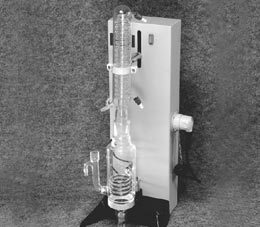 In the All Quartz Double Distillation the components coming into contact with water are quartz glass parts which, contrary to ordinary laboratory glass are non-hygroscopic and thus resistant to H20. These properties warrant the high purity requirement a distillate must fulfill.. High quality electronic grade quartz is used in the fabrication of this apparatus. This range of quartz double distiller provides answers to ultra pure water for research and bio- technological requirements. The Automatic Electronic Dual cut-off system is used along with the Water Distillation unit to protect the distiller during water supply failure. Its cuts off the power supply in two cases. b) In case of water failure to the Boiler, the power supply to the unit is cut off automatically by means of pt-100 sensor. AEDCS-1 ELECTRONIC DUAL CUT-OFF SYSTEM Upto 2.5 Liters/Hr. AEDCS-2 ELECTRONIC DUAL CUT-OFF SYSTEM Above 2.5 Liters/Hr.